Today my neighbor and I made 72 ornaments for the Christmas tree we are decorating for the Family Trees exhibit at our local museum. Every year, volunteers decorate about 35 - 40 trees throughout the museum. Each tree interprets a children's book - some classics and some new. Some of the authors and illustrators come for a special event in December and many families in the area have a tradition of visiting the trees exhibit every year. I'll show you the ornaments and the rest of the tree soon - I have to wait until the display goes up next week. After spending hours cutting and assembling ornaments and doing some essential errands, I had no time left to work on my other projects. So today I just have a few quick things to share. First, the card at the top of this post is one that I made last week at the "Card Bar" at our local stamping and scrapping store. On Tuesdays they set up a make and take project - so I try to go there on Tuesdays to try new things. 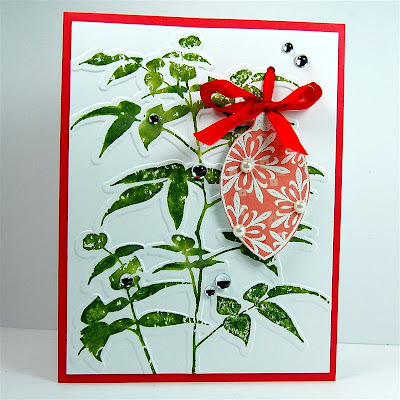 This card was made with one of the Hero Arts stamp and Sizzix embossing folder combos that came out this year. The set is called "Birds N Trees." There is a large background stamp and a matching embossing folder - you stamp first and then line up the stamped image with the folder to emboss the card front. 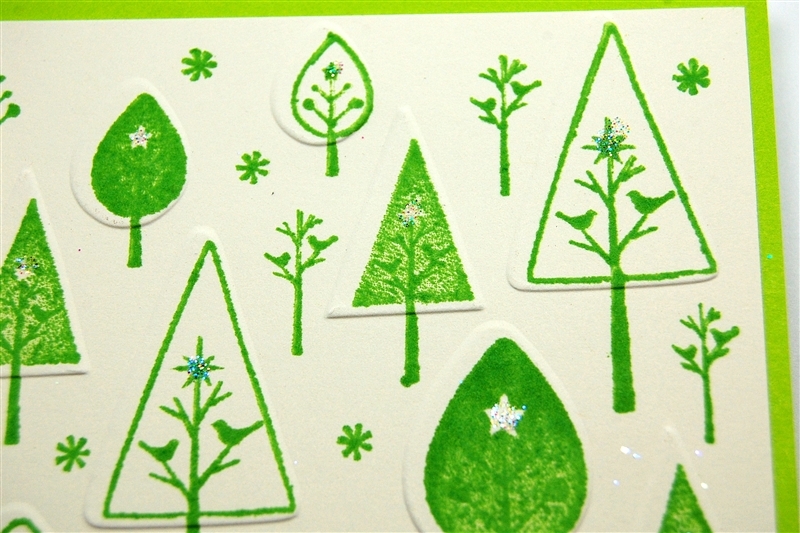 Here is a closer view - I didn't get the stamp and the folder perfectly centered but the added texture makes the card more interesting. We added some bits of glitter on the stars (hard to see in the photo but it is sparkly in the light). This is the same technique that I tried in the class at CHA last summer. 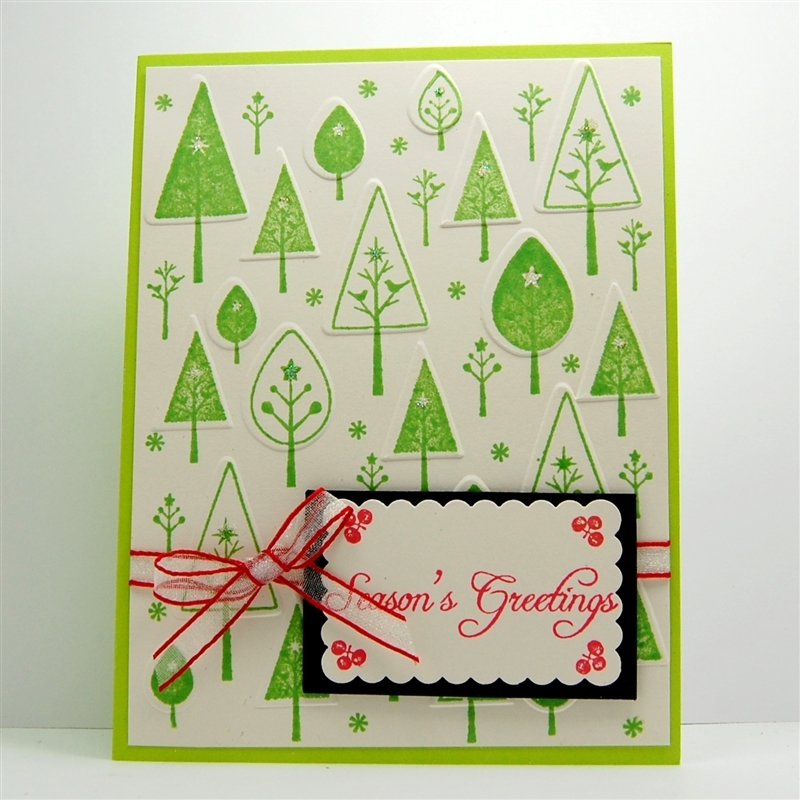 We made this card with the "Artistic Fern" set and I really liked the idea of using an image that is not specifically made for Christmas for a holiday card. You can see more about the card at THIS POST from last summer. The new Cricut Mini machine was launched this morning - this machine requires the Cricut Craft Room and an internet connection or the Gypsy to cut and can cut shapes from 1/4 inch to 11 1/4 inches on an 8 1/2 x 12 inch cutting mat. You can see lots of information about the new machine on the Cricut.com site HERE and the Official Cricut Blog HERE. As with most Cricut products, the Mini was released through HSN and the bundle offered has some exclusive items included (though the definition of "exclusive" can be a bit confusing - lately most of the "exclusive" items don't seem to stay exclusive very long). There is also a lot of new content that is digital only and can be purchased and accessed through the Craft Room. You can see this content in the Craft Room online - click HERE to try out the Craft Room if you haven't already had a chance to check it out. I don't think I will be buying this machine - I have plenty of Cricuts now and, unless the Craft Room adds more design tools that allow you to create your own images, I'll probably get the Cameo or the Zing as my next new machine. I really enjoy creating my own designs in addition to just manipulating the cartridge content. It will be interesting to see how well this machine cuts - I have been very disappointed in the cuts from my E2 and need to call to see if the machine needs to be replaced. If you go to a lot of crops, the smaller size might be appealing but it is often difficult or expensive (or both) to get internet access at crops. I'll be interested to hear what you all think about the mini. There is a 30% off sale on Thanksgiving-Autumn content (just click to go the the page - it is listed under "Featured Products" and a little tricky to find). The sale lasts through November 16th (Wednesday) and Creative Memories is in the Central Time Zone - just so you know which midnight is the deadline! Sorry for the quick post - with luck I'll have a chance to finish at least one of my Thanksgiving projects tomorrow. My Dad came home from the hospital Monday and is settling back into his apartment - I can't wait to see him in a few days. Are you getting your Thanksgiving plans together - the days are flying by for me and we will be leaving for a week the day after Thanksgiving so I have a lot to do before then! I hope you have a great day! I watched the launch of the Mini. I too think that this is a machine that I can pass on. I appreciate the smaller footprint, but don't think that the smaller cutting size is one that I need. Thanks for your thoughts! If I order Templates are those whats called a drop and fill? If I order embellishments can I add more embellishments to a premade template.? Then I noticed the template pages, are these where I pick the colors and fill in spaces? Then I noticed the additions packs. These must be kits to be used with the blank templates, Can you switch out a color on a predesigned page? I really havent had time to play with the soft ware as Ive had some issues with PCraft. How should I start and whats the best way to save the packs you buy...?? I feel a liitle computer illiterate. WWhere should I start and how do you organize purchased kits. Is there a system with in the program to store them. I should have more time to play with 4.0 and read the tutorials esp.since I had to send my E2 back to PC. If you could just give me an overview Ide fell less intimidated, and Ide really appreciate it. I found your blog through your excellent tutorials on DS. Now I don't use DS anymore and have purchased the Silhouette sd. I have a Zing on order. I LOVE, love love MAKE THE CUT, so I will not put the money on the cameo. I like working through my computer program. Thanks for your unbiased reviews/thoughts. I, too, have cutting problems with the E2 (HSN model from late September 2011). I also had problems with the machine reading the newest cartridges I have purchased: Art Nouveau, Word Collage and CM's Tis the Season. ProvoCraft sent me replacement cartridges, but they did not work either. Apparently it was a software glitch which they have since fixed, so now all three cartridges work for me. Be sure to run Cricut Sync again if there is any problem reading cartridges. As for the cutting problem, they first sent me new blades, which improved the cut from a fuzzy mess to a clean cut (but only if I did two or three passes). Now they are sending a new blade housing, so I'm hoping that will allow me to cut most papers with only one pass of the blade. They were very nice at ProvoCraft, but there was quite a wait to actually speak to someone. That's my story. I hope it helps you. My Zing should be here tomorrow. I just can't wait.